Choose from our massive stock of Pit Bike parts & spares. FRIENDLY CUSTOMER SERVICE: 01789 766777. Levers, Cables & Kick starts. Pit Bike Tools & Care. Quick Action 1/4 Turn Throttle. Mini Moto & Midi Moto. New Lifan 125cc Big Valve Head 4 Speed Manual Pit Bike Engine Full Package. THIS IS A BRAND NEW LIFAN 125cc AIR COOLED 4 SPEED MANUAL BIG VALVE HEAD ENGINE, FITTED WITH 23mm INLET & 27mm EXHAUST VALVES AS STANDARD. IT WILL BE SUPPLIED WITH KICK START, GEAR LEVER, INLET MANIFOLD & GASKETS, MIKUNI VM22 CARBURETTOR & TWIN FOAM FILTER, COMPLETE WIRING LOOM TO RUN THE ENGINE. IT HAS A 5 WIRE STATOR PLATE SO WILL POWER 12v LIGHTS IF FITTED TO A MONKEY BIKE ETC. 4 SPEED MANUAL GEAR BOX N1234 WE SELL THIS IN OUR OTHER ITEMS AS A FULL PACKAGE OR WITH A CARB ALSO WE HAVE THE SEMI AUTOMATIC VERSION. THESE ENGINES ARE 445mm LONG, 280mm WIDE. TOP MOUNTING IS 93mm WIDE WITH A 8mm BOLT HOLE, REAR MOUNTING IS 82mm WIDE WITH A 8mm HOLE. THEY ALSO HAS THE 4 M8 THREADED HOLES ON THE UNDERSIDE WHICH ARE 88mm APART LEFT TO RIGHT AND 44mm APART FRONT TO BACK, THESE ARE TO THE HOLE CENTRES. IF REPLACING AN ELECTRIC START ENGINE AND USING LIGHTS YOU WILL NEED TO REPLACE THE VOLTAGE REGULATOR. DON'T BE SUCKED IN BY RUBBISH THAT THERE ARE DIFFERENT VARIATIONS OF ENGINE OR GEARBOX. LIFAN ONLY MAKE 1 GEARBOX FOR EACH TYPE OF ENGINES THEY SELL, THEY DO HOW EVER OFFER DIFFERENT GEAR CONFIGURATIONS. REMEMBER THIS A LIFAN ENGINE, NOT A BUDGET ENGINE BADGED UP BY A PIT BIKE IMPORTER. WE CARRY MOST PARTS YOU COULD WANT FOR LIFAN PIT BIKE ENGINES. CHECK THROUGH OUR OTHER ENGINES FOR OTHER CC'S OR DIFFERENT ENGINE PACKAGES. BEFORE YOU CONSIDER PURCHASING ELSEWHERE TAKE A LOOK AT OURS AND OUR COMPETITORS FEEDBACK. MOST HAVE HAD MORE NEGATIVES IN THE LAST 30 DAYS THAN WE HAVE HAD IN A YEAR! Order before 2pm Tuesday to Friday and 12 mid day on Mondays or Tuesdays after a Bank Holiday for same day dispatch. Please let us know if you are having problems paying otherwise an unpaid item case will automatically start after 4 days. We are a UK based business and are specialised in Pit Bike Parts only. Our priority is our customers complete satisfaction. We provide an extensive range of parts matched with competitive prices and rapid dispatch time. Our customer services number is 01789 766777. 190mm SDG RAZOR FLOATING BRAKE DISC FOR PIT BIKE WITH BOLTS. 220mm SDG RAZOR FLOATING BRAKE DISC FOR PIT BIKE WITH BOLTS. Steel Barrel & Piston Kit With Gaskets For Lifan 125 Pit Bike Engine. CLUTCH CABLE FOR PIT BIKE 110cc & 125cc FITMENT. Day late but excellent service and communication. 2.50 - 2.75 12 PIT BIKE INNER TUBE. FITS 70 OR 80/100/12 STRAIGHT VALVE. Service & Repair Workshop Manual. New GN125 BD125cc 4 Speed Manual Pit Bike Engine With 18mm Carb. New BD125cc 4 Speed Manual Pit Bike Engine. New Lifan 125cc Big Valve 4 Speed Semi Auto Pit Bike Engine Carb & BBR Manifold. New Lifan 125cc Big Valve 4 Speed Semi Auto Pit Bike Engine. 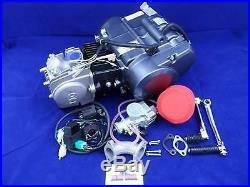 New Lifan 110cc Electric Start 4 Speed Manual Pit Bike Engine & Carb T/S. FEEDBACK WILL ONLY BE LEFT ONCE RECEIVED. FEEDBACK IS TO BE USED ONCE YOUR SATISFIED AND IS NOT THE PLACE TO WRITE PROBLEMS WITHOUT CONTACT. WE ARE A UK BASED BUSINESS TRADING SINCE 2005 AND ARE SPECIALIZED IN PIT BIKE PARTS ONLY. We are a UK based business trading since 2005 and are specialized in Pit Bike Parts only. Our priority is our customer's complete satisfaction. We provide an extensive range of parts matched withcompetitive prices and rapid dispatch time. Keep in touch - Sign up today. Get the latest offers directly to your inbox! The item "New Lifan 125cc Big Valve Head 4 Speed Manual Pit Bike Engine Full Package" is in sale since Wednesday, August 8, 2018. This item is in the category "Vehicle Parts & Accessories\Trials & Motocross Bike Parts". The seller is "rhinomotad" and is located in GB. This item can be shipped to United Kingdom.